What is The Empathy Set? The Empathy Set comprises two sets of cards: 56 feeling cards and 56 needs cards. Together, they are a powerful communication tool that support empathy and emotional intelligence – and so relational harmony. As the late Marshall Rosenberg would say, "empathy is demonstrating an understanding of another's feelings and needs!" You are in the right place to learn more about how to use these magical cards....and where to get your own set! To get Your Empathy Set for $24.97, available on Amazon Prime, click here. Who needs the Empathy Set? The Empathy Set is ideal for everyone, for in truth, we all have challenges communicating positively, without judgment and put downs. Specifically, the Empathy set is ideal to explore how we are feeling and what we are needing from our family members, whether it be our parent, our sibling, our children, and our relatives. The Empathy Set is perfect to prepare for a difficult workplace conversation with your boss, your peer or your subordinate. The Empathy Set is a powerful tool in the hands of mediators and trainers who want to support their client’s transformation. One of the reasons, is that we don’t have the tools. For the most part, as judged by expenditure on the ways of war vs the ways of peace, we are clearly more interested in war, not peace. So, we often find ourselves challenged by those closest to us, our family and our work colleagues. We care about the relationship. But feel unhappy about something. And our valid needs aren’t being met. If we tend to conflict avoidance (they say that is about 50% of us) we are likely to bottle up our resentments. And risk using alternative, more passive aggressive ways of expressing ourselves, like sarcasm. Sometimes, we may surprise everyone and erupt. If we tend to be more confrontational in our conflict situations (about 25% of us) then we are likely to be afraid of our anger getting lose and us saying and doing things that we will later regret. If we tend to collaboration (the final 25%) then we are doing our best to apply the relationship wisdom of our times. Some of it pertains to how we communicate without judgment. Judgments are seen and felt as attacks. So, when we judge, we can expect defensiveness. And the further fracturing of the relationship. When all we wanted to do was let this person we care about, know that our feelings got hurt, and this is what we are needing going forward. Expressing yourself using a positive statement of what you felt, about what you observed, linking it to your needs and ending with a request, is commonly referred to as an I Statement. So, for example, if someone often (not always) speaks before you have finished, it stimulates your frustration. Being able to communicate your ideas in full is important to you. Which is why you are making a request that you are allowed to finish talking first, before the other person does. Making a request is better than not saying anything and having to contain your negative feelings. Some say the hardest part is describing your observations without implying judgment. Regardless, what is also challenging, is getting clear on what exactly you felt (in the past and now), and importantly from a problem-solving perspective, what you need, moving forward. Which is where the cards enter the picture. They help you get in touch with all your feelings. Not just the anger at the tip of the iceberg. Also, the sadness and the fear, that especially the men aren’t always socialized to feel. Users of the cards frequently express surprise that they had so many feelings about something. And of how helpful it is to identify the few key feelings that are at the heart of it, and that fully validate your experience. When it comes to the needs, it is the same. Amazement that they have so many important needs that are not being met. But also often the realization that other needs of theirs are being met. When two people in relationship, take the time to express what they feel and what they need, they set themselves up to problem solve. 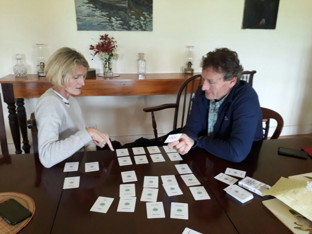 So, in a nutshell, the cards are a tool that get you in touch with vital information that you need so that you can communicate positively what you are feeling and needing, without judgment, and then problem solve to find a solution that meets everyone’s needs. Exactly how are the cards used? You can read the instructions for the cards here. You can use them to get clear about what you are feeling and needing in respect of any relationship, situation or event. You can use them to sense what someone else is feeling and needing about your relationship, situation or event. You can use them to problem solve and to find lasting solutions based on both of your valid needs. And finally, you can use them creatively with groups to clear the air and help move on from the pain of the past. Hi, I'm John Ford, author of Peace at Work, and founder of The HR Mediation Academy. I've been helping people resolve conflicts for 30 years now, first as an attorney in Namibia and for the last 22 as a workplace and divorce mediator in the San Francisco Bay Area. These are the most powerful communication tools I have encoutered. Every time I use them people ask where they can get a pack. They help humans have difficult conversations and restore harmony to their relationships. They will help you get clear about your feelings and needs. So you can express your voice positively. What is often missing in our relationships. Pick up a set through the convenience of Amazon.